A microtiter plate was coated overnight with various antigens at a concentration of 5 μg/ml. After washing and blocking with PBST+5% BSA, detection was performed using Human Anti-Bacterial Alkaline Phosphatase:HRP Antibody (clone AbD25296_hIgG2) at a concentration of 2 μg/ml followed by Mouse Anti-Human IgG (Fc) CH2 Domain:HRP Antibody (MCA647P) in HISPEC Assay Diluent (BUF049A) and QuantaBlu Fluorogenic Peroxidase Substrate. Western blot analysis was performed by loading 25 μl Hela lysate (lanes 2 and 3) and Precision Plus Protein™ Prestained Standards (lane 1) onto a AnykD™ Criterion™ TGX Stain-Free™ Protein Gel. The gel was run under reducing conditions and proteins were transferred to a nitrocellulose membrane. Lane 2 was probed with Anti-HSPA8 Antibody, clone AbD28028 Fab-A-FH format, at a concentration of 10 μg/ml. Lanes 2 and 3 were then probed with Human Anti-Bacterial Alkaline Phosphatase:HRP (clone AbD25296_hIgG2, HCA275P) at dilution of 1/1000. Visualization was carried out using the ChemiDoc™ MP Imaging System with an auto exposure. The Western blot bands (red) and protein standards (green) have been pseudocolored. Fab-A-FH format is a bivalent bacterial alkaline phosphatase fusion antibody (DYKDDDDK- and His-6-tags). A microtiter plate was coated overnight with recombinant GFP antibody (His-tagged) at a concentration of 5 μg/ml. 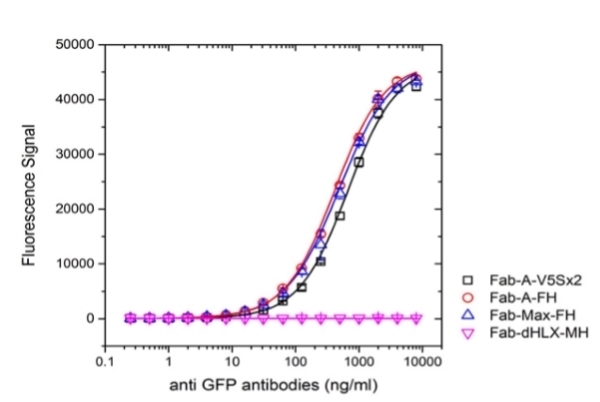 After washing and blocking with PBST+5% BSA, detection was performed using primary human anti-GFP antibodies in different bivalent Fab formats (e.g. Fab-A-V5Sx2) titrated to the given concentrations in PBST, followed by Human Anti-Bacterial Alkaline Phosphatase:HRP Antibody (clone AbD25296_hIgG2) at a concentration of 2 μg/ml in HISPEC Assay Diluent (BUF049A) and QuantaBlu Fluorogenic Peroxidase Substrate. Data are shown as the mean of triplicate measurements. This HRP conjugated Anti-Bacterial Alkaline Phosphatase Antibody is recommended for use as a secondary detection reagent with HuCAL antibodies in Fab-A and Fab-Max formats. Human Anti-Bacterial Alkaline Phosphatase Antibody, clone AbD25296_hIgG2 recognizes bacterial alkaline phosphatase (BAP), a periplasmic enzyme which catalyzes the release of 5'- and 3'-phosphate groups from DNA, RNA and nucleotides. BAP can also dephosphorylate a number of proteins and alkaloids, and has an optimum pH of 8.0. BAP is encoded by the phoA gene, and forms a homodimer of two identical ~47 kDa subunits. Fab-A and Fab-Max format antibodies generated using HuCAL® technology are formed via dimerization of BAP. 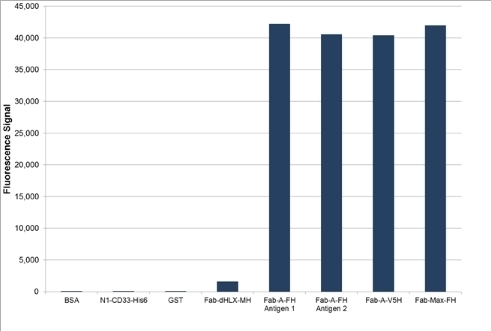 The Anti-BAP Antibody HCA275P can be used as a secondary detection reagent with HuCAL antibodies in Fab-A and Fab-Max formats (Fab-Max is a modified BAP fusion antibody with inactivated enzymatic activity). View further information about HuCAL antibody formats.